If you have an appetite but in a hurry then it doesn´t get any more straightforward than this. Minimum list of ingredients, minimum preparation and short cooking time. 1. Melt the butter with the cinnamon stick in a deep, heavy based pan over medium heat until melted. Remove from the heat. 2. Cook the gnocchi in a large pot of boiling salted water until all the gnocchi rise to the surface. 3. Discard the cinnamon stick from the butter sauce and reheat over low heat. 4. Using a slotted spoon, transfer the cooked gnocchi to the hot cinnamon butter in the heavy based pan. 5. Sprinkle with the sugar and ground cinnamon. Toss to coat and add more sugar, to taste. 6. 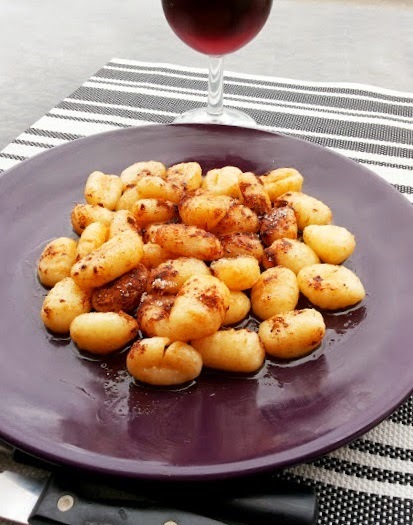 Spoon the gnocchi and butter sauce onto plates and serve immediately.